Acting Balanced: Sneak Preview - Winter Follower Giveaway Tour!!! 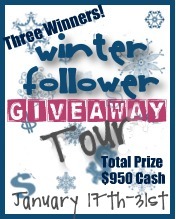 Sneak Preview - Winter Follower Giveaway Tour!!! The Winter Follower Giveaway Tour is  coming soon! Meet the participating blogs and start following them now so you won't miss a thing!